That is how the trained soldier looks at battle and some others not all, look at is just shoot and loot game. When I am playing I try to look at it from a military perspective and operate from there. Of course mistakes have been made but it is just a game and I usually find myself trying to think what the real commander would do and go that route. Now that I have had more time in the saddle with this time period I think I am getting better at it every game only because of my favorite oh you got slaughtered again Mike friends. I think I am going to start writing the commanders names down and read up on them and try and act as they did in battle if that is even remotely possible. Are we doing anything this afternoon? So in making this Sunday scenario when the AI made that unexpected attack ... did the AI choose the timing and axis of attack? PS: I completely forgot to say that last night's battle was the first battle that I as a divisional commander actually got to act like it too: meaning I had human brigade commanders for all my units and was just handing out orders - for me this is so much more fun... 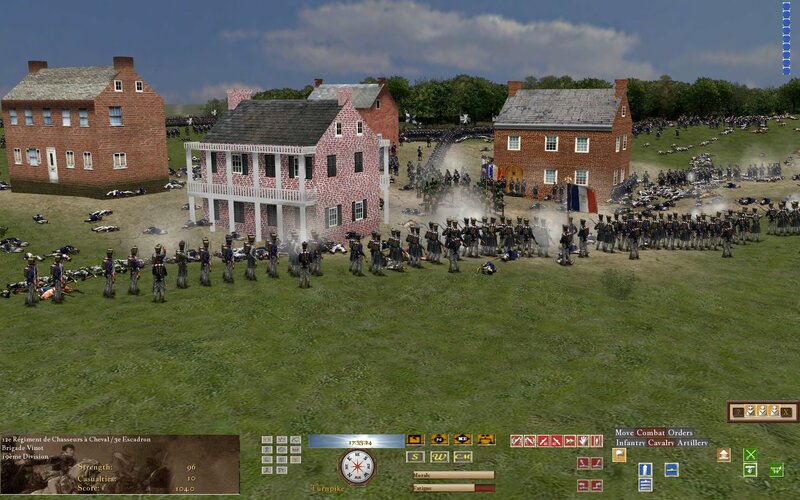 I really enjoyed it - a big thanks to WJPalmer, NYCavalry and Charmead for acting as Brigadiers! Point and click is one thing but explaining to 3 different players where to go and what to do is so much more realistic and enjoyable... pity I dropped... would have liked to stay till the end! They all showed restraint, prudence and interest in executing the orders as I handed them out - thanks again for making this a fun fight! You da boss. It is fun to follow orders via courier in this game. It was an excellent game. I especially enjoy these scenarios that are based on historical actions -even if only loosely. I had Taff and Tom as my two infantry brigade commanders Bellair (5 Btns) and Thevenet (4 Btns) leaving me with just 3 squadrons and 2 batteries to look after. As both my brigadiers were quite new to things I wasn't sure how much or how little guidance they would need. 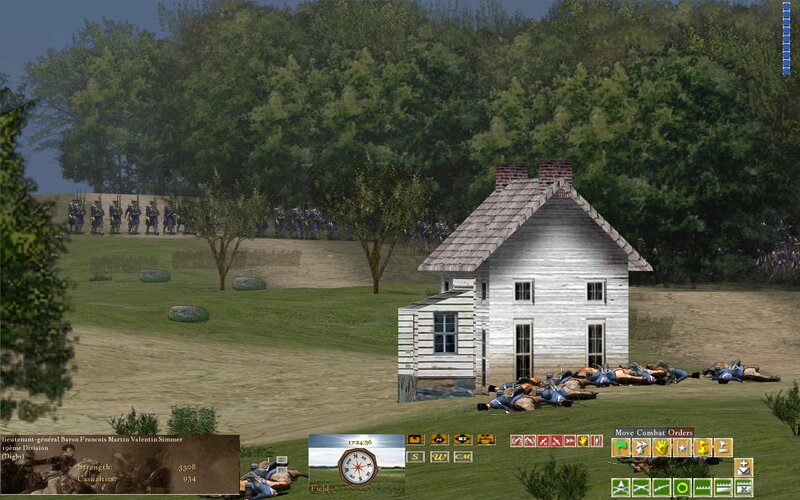 Luckily at the start the division was in a good position on rising ground north-east of Plancenoit so I just gave one the left flank, one the right, allocated a battery to support each and left them to deploy as I went forward with some cavalry. I soon found the enemy coming down the main Wavre-Placenoit road and after a fun bit of skirmishing with them, fell back to my division having been told by Lobau that enemy was also moving on Rozieres from the SE and we were to fall back on "Plan B". I then discovered how much work it is to issue orders to newish players to get them into a position I thought the best available but which was also critical and had to be done quickly without any useful named locations on the minimap and no ability to check it once I was writing a message... *rolleyes*. I ended up placing my two batteries and asking my brigade commanders to form on them! A bit of a cheat but it worked. 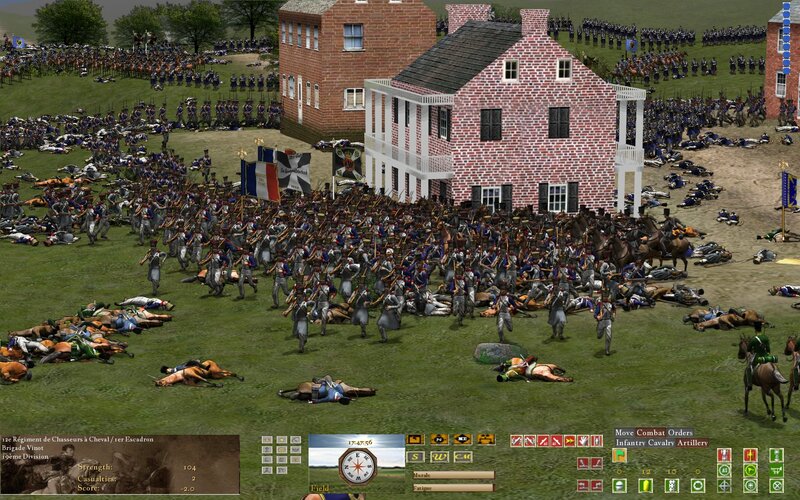 I then went forwards again with the cavalry to "talk" to Jeanin who had decided to ignore the corps plan and defend Plancenoit from the east all on his own despite being told he was being outflanked from the south. Lobau sent several messages, I sent several messages all to no apparent effect and it wasn't until the Prussians occupied Plancenoit behind Jeanin that he seemed to wake up and swing his defences from east-facing to south-facing. I then had another wonderful encounter with My[expletivedeleted]GUI when I found that not only does an incoming player message close your outgoing message screen but unless you notice instantly your typing converts from message text into game commands. Oh what fun! What jolly japes. I think this is what caused me to inadvertently send a divisional movement order to all commands in the division to advance on Plancenoit from the NW. My TC'd batteries and cavalry ignored this but to my chagrin a while later I saw all my infantry advancing towards Plancenoit contrary to orders to stay on the high ground. I sent fresh and rather peremptory orders to Bellair and Thevenet to stop and go back to the guns and was greeted by confused replies from them both! It was at least a realistically created confusion in intent but I grew a few new grey hairs. In the end an exasperated Lobau ordered the rest of the corps to return east to support Jeanin and an intense battle blew up both south of Plancenoit where Teste was getting his balls kicked and within the town with Bellair doing a superb job of holding it for a good while against obviously superior numbers of opponents. Eventually sheer weight of warm bodies began to tell and I committed my last 2 chasseur squadrons to throw back the advancing Prussians in the streets although Bellair only escaped with one battalion. 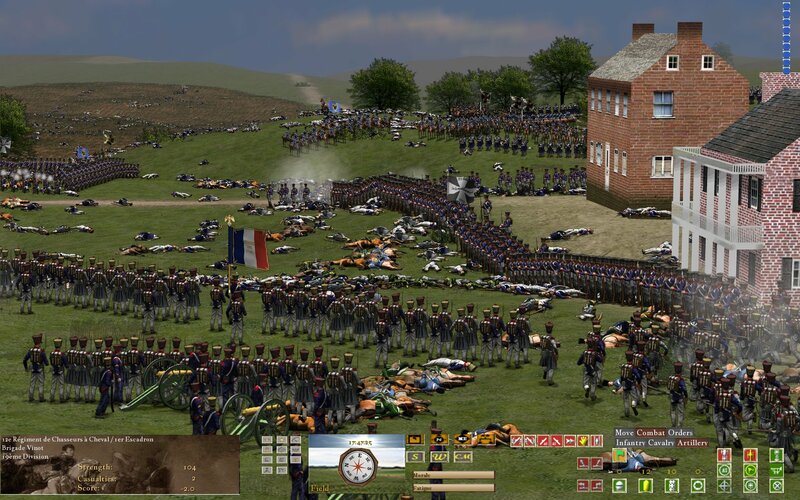 Thevenet now occupied the ridge directly west of the town and stalled the enemy there for a while before a general order from Corps came to fall back. By now the fifth column of Prussians had arrived from the north and pushed Jeanin back to the town as well. Evening was advancing quickly and with news of Wellington's army in the north west withdrawing along the Brussels road and a combined final attack by the Middle and Young Guard assisting him on his way, our troops withdrew to let the Prussians have a hollow victory of control of the town, much good that it would do them with the Anglo-Dutch army in retreat. Thanks to Tom and Taff for playing very well as excellent subordinates and for dealing with my contradictory and odd messages in the true spirit of the game! Some artist's sketches of the fighting in the town. This was a seriously serious dust-up with numerous melees, some of them involving up to five units at the same time. Prussians emerging from the woods in the north - very Waterloo-like. Uncle Billy wrote: The attack by that 5th division was very unexpected. He must have been very satisfied to see it develop as it dashed any hopes the French may have had of winning. The division coming down from the north was one of two possible traps I thought the scenario might set for the CinC. The other was a late move by the AI Prussians against the objective in the area of Roland's original position. If Teste's hormones got the better of him and he reacted too quickly to the action in the east, it could well have resulted in the French line being compromised from the west. In testing, each of these occurred about half the time. The thing that made them especially interesting was that each could potentially come about after Kevin was forced to choose whether or not to send the Young Guard back to the Boss. Hence, "Lobau's Decision" was an extremely important one. Although he could not possibly be aware of all the factors at the time, I think Kevin made the correct choice. you do realize that mentioning any sort of compliment in the general direction of Kevin leads to a multitude of disasters... right? Hence the qualification "he could not possibly be aware of all the factors at the time" -- a nice way of saying it was all dumb luck. 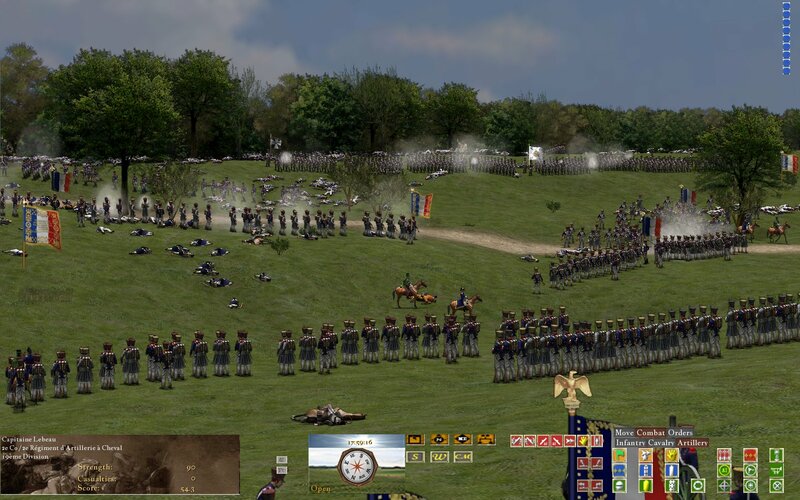 "I then went forwards again with the cavalry to "talk" to Jeanin who had decided to ignore the corps plan and defend Plancenoit from the east all on his own despite being told he was being outflanked from the south. Lobau sent several messages, I sent several messages all to no apparent effect and it wasn't until the Prussians occupied Plancenoit behind Jeanin that he seemed to wake up and swing his defences from east-facing to south-facing." I, Jeanin, received all the couriers and sent Ben, who had Bourgeois' brigade, my largest, at least 15 couriers ordering him to fall back across the creek and link up with Digby's left. Ben, who must have sent me 15 couriers warning of his flank's predicament, apparently didn't read any of my couriers. 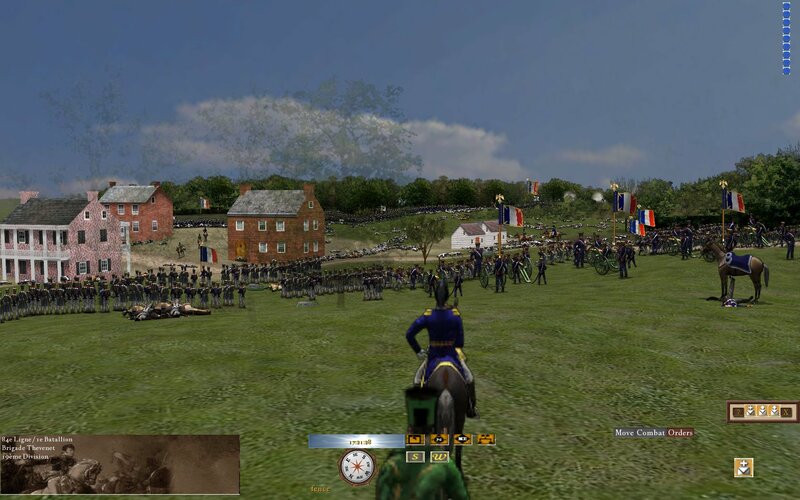 Finally I rode up to him and moved him to a different ts channel and read him the riot act and told him that if he didn't start moving immediately, I was going to abandon his left flank and let the Prussians make sausage out of him. I think that's by far the most couriers I've ever sent in a game, perhaps more than all other games combined, and not one was actually read! That's why courier play is so much fun, because in the heat of battle a general just forgets to read his messages, or maybe can't. It was strange that Ben's brigade withdrew well NW of the town at first but then went all the way back again. I'm curious Mark, why you stayed over there at all and didn't come back west with the rest of us. A panorama of the defence of Plancenoit painted inside the rotunda of the "Eagle Mound" which was ordered to be raised on the site of his final victory by Napoleon. The mound was constructed of captured Prussian sausage and English tea bags. 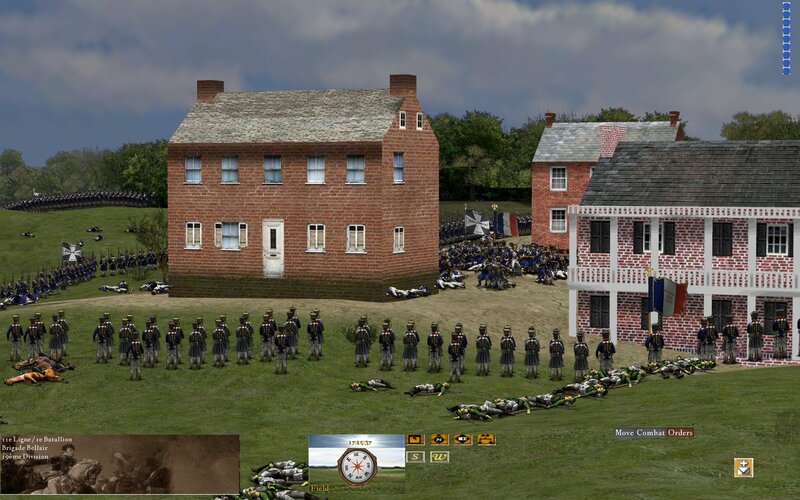 Digby wrote: A panorama of the defence of Plancenoit painted inside the rotunda of the "Eagle Mound"
No doubt the local Belgian peasantry would be tasked with hauling the dirt to fill in around the sausage and teabags as well. They just can't catch a break. Very nice image. Looks like something Norb ought to use in his promotional materials. Charmead wrote: So in making this Sunday scenario when the AI made that unexpected attack ... did the AI choose the timing and axis of attack? It did, although I was aware there was a good possibility it would from playing out the results from a variety of setups. There's only a very limited control that can be exercised over the AI in coming up with these things. In fact, control is too strong a word. It's more like providing hints and guidance by, as Kevin says, the placement of units and objectives. It still does some strange things, but in SoWWL the AI seems better at recovering and turning in a more believable performance than in SoWGB and most other wargames. "I'm curious Mark, why you stayed over there at all and didn't come back west with the rest of us." Kevin ordered me to the northeast of town. How strange, I wonder if Lobau is available for comment? I am not sure if someone mis-wrote a message, misread it or the NE was deliberate so Jeanin's division would be destroyed! You basically fought the Prussians unsupported for 45 minutes in the location my division started... And was told to retreat from... This could be... Plancenoitgate. Yeah. 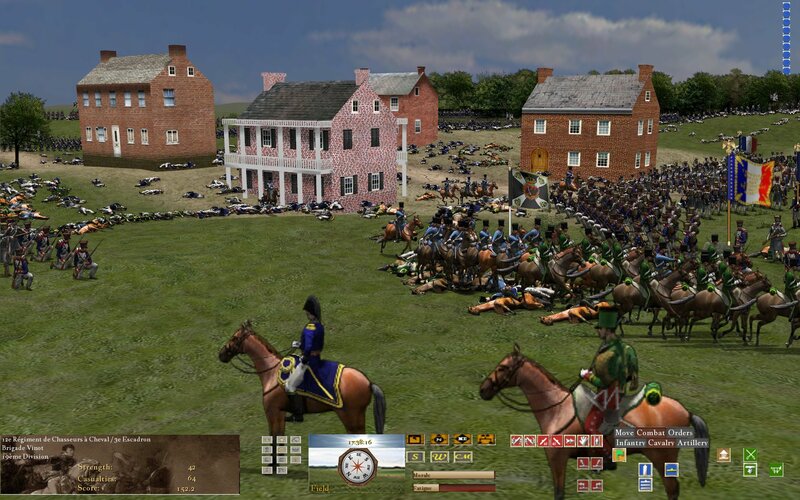 . . there were at least 50,000 Prussians in front of me, my brigade commander wasn't obeying my orders, I saw some Prussians moving behind me, and then Kevin sends me a courier telling me that after I've driven of the Prussians in front of me to move up and block the road coming from the east. About 10 minutes after that entire division showed up behind me, Kevin suggested I might want to fall back to the big hill Digby was on. Sometimes I question his motives. I would have liked to be there. Weren't you ordered to lead from the front Mark? Of course, Pepe. But then I was ordered into a trap. But I am too quick for him. Meaning I thwarted Kevin's plan to get me encircled and destroyed. 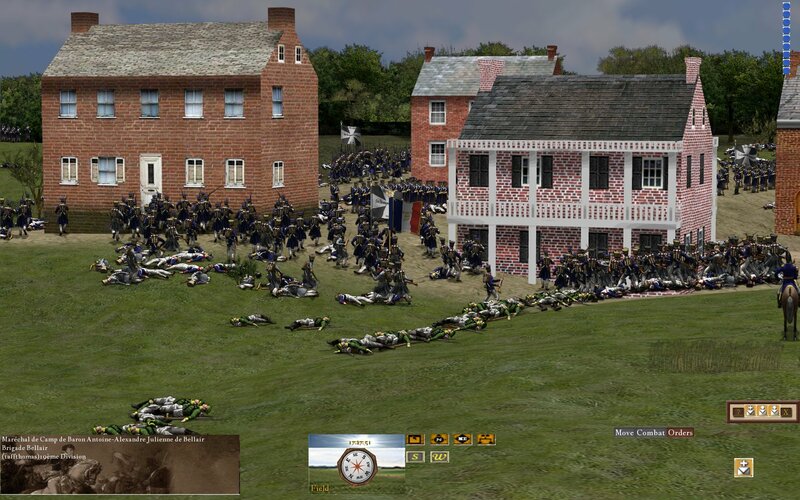 I put the hurt on those Prussians or Austrians (I have trouble telling the difference between the two) in front of me and those coming from the east before moving my base west because of the division coming up from behind me. I think that was Kevin's first mistake - making someone a divisional commander who can't even tell the difference between Austrians and Prussians... they're as different as Colonials and Russians... or French and British... no wonder we lost this fight...you were probably as lost as Charmead when it comes to your position on the map! WHEREAS: Austrians will always be dressed in the best possible way - we prefer the colour of white since it is the most majestic one out there - thus the only fitting one for a soldier of the one true Empire! We are gentlemen, trained in the art of war for decades... while Prussians usually just grab a gun, go through basic training and then rush off to the front...smelling of sausage and onions...Austrian officers always had the tradition of acquiring their own supplies - we can't be bothered to eat mashed potatoes with potato soup with Sauerbraten and potato wedges.... did I mention potato cream tart for desert? Did the Belgian army eat frites and mayo? Final exam was we had to draw a straight line that pointed north from Vienna and I got highest score in class of 85%. And that is consistent with my performance in the Sunday match since I maintained situational awareness about 85% of the time. The fact that the other 15% occurred at a key moment in the fight is something I do not mention in any official report.